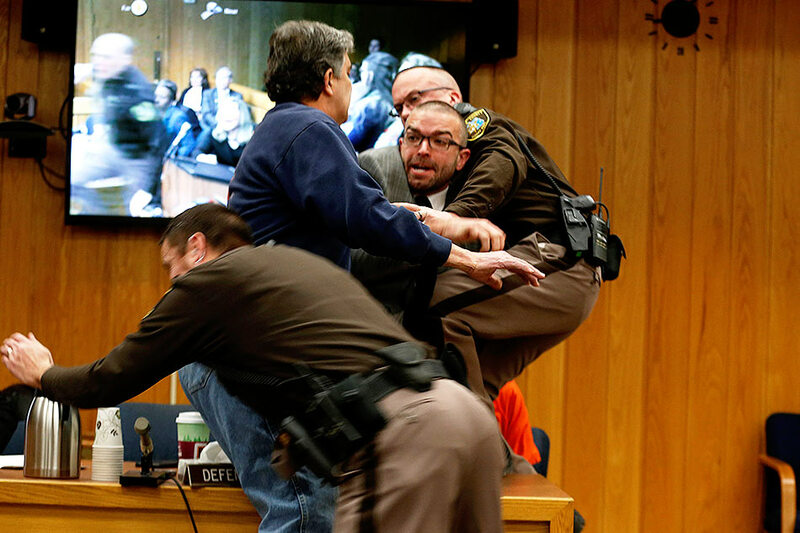 "I would ask you as part of the sentencing to grant me five minutes in a locked room with this demon," he said, gesturing toward Nassar, who has already been sentenced to up to 175 years in prison at an earlier hearing after pleading guilty to molesting young women under the guise of medical treatment. "What if this happened to you guys?" he implored of the court officers as they pulled him out the room. "I understand Mr. Margraves' frustration but you cannot do this," she said. "This is not helping your children." The hearing resumed after a short break, with the judge addressing what she called a "scary" scene. "My heart started beating fast and my legs started shaking," Cunningham said. "We cannot react by using physical violence," she said, noting she could not imagine Margraves' pain as a father. His case has sparked broader outrage after numerous victims accused USA Gymnastics, the sport's governing body, and Michigan State University, where Nassar worked, of failing to investigate complaints about him going back years. U.S. Olympic officials have also been criticized by some of the sport's biggest stars, including gold medalists Aly Raisman, Simone Biles and McKayla Maroney.